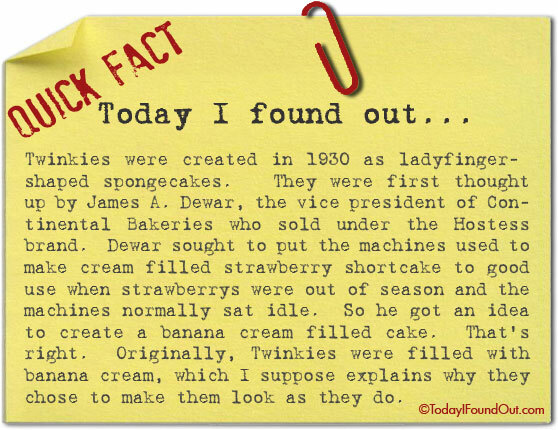 Twinkies were created in 1930 as ladyfinger-shaped spongecakes. They were first thought up by James A. Dewar, the vice president of Continental Bakeries who sold under the Hostess brand. Dewar sought to put the machines used to make cream filled strawberry shortcake to good use when strawberrys were out of season and the machines normally sat idle. So he got an idea to create a banana cream filled cake. That’s right. Originally, Twinkies were filled with banana cream, which I suppose explains why they chose to make them look as they do.